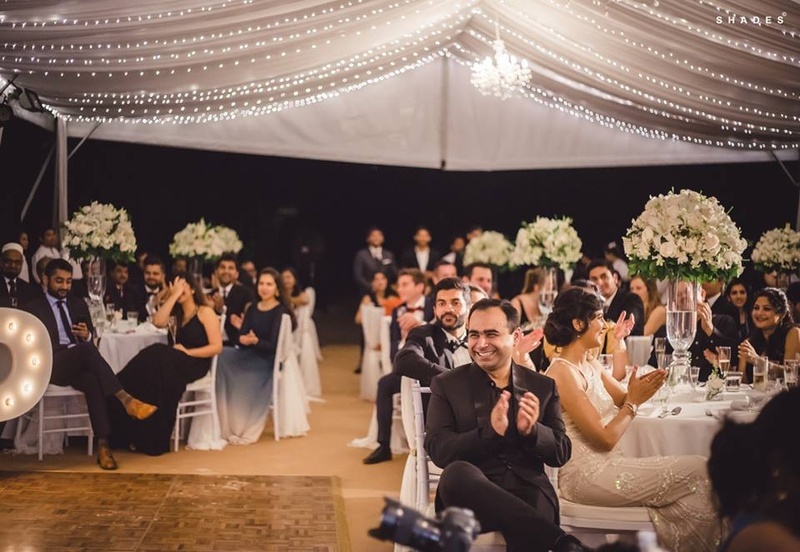 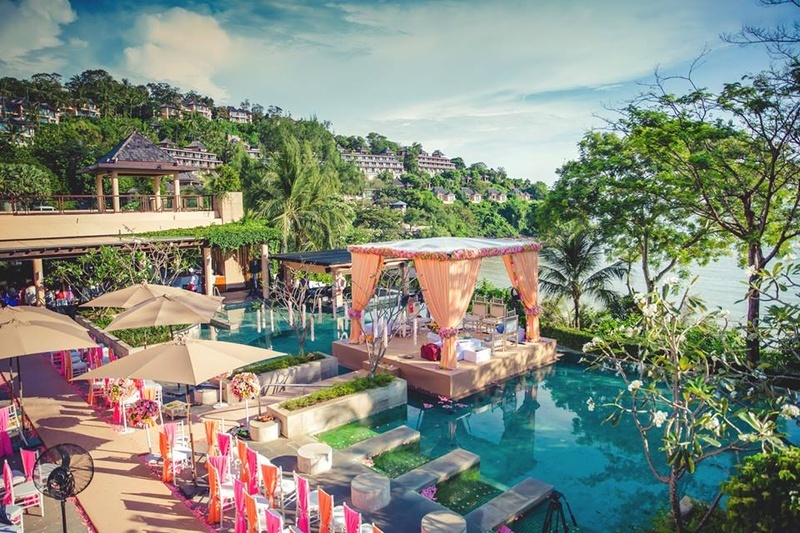 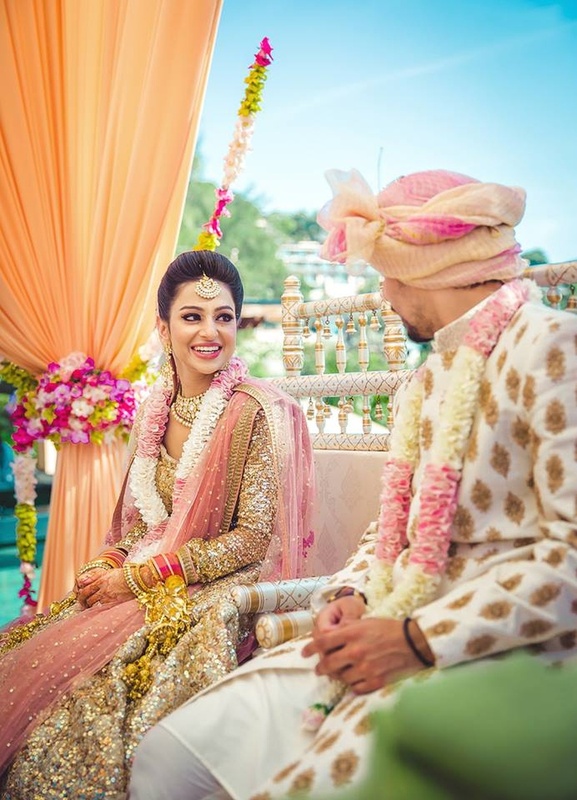 Have a look at the grand wedding of this couple that took place amidst the beautiful beaches of Phuket and is sure to set new wedding goals for every couple. 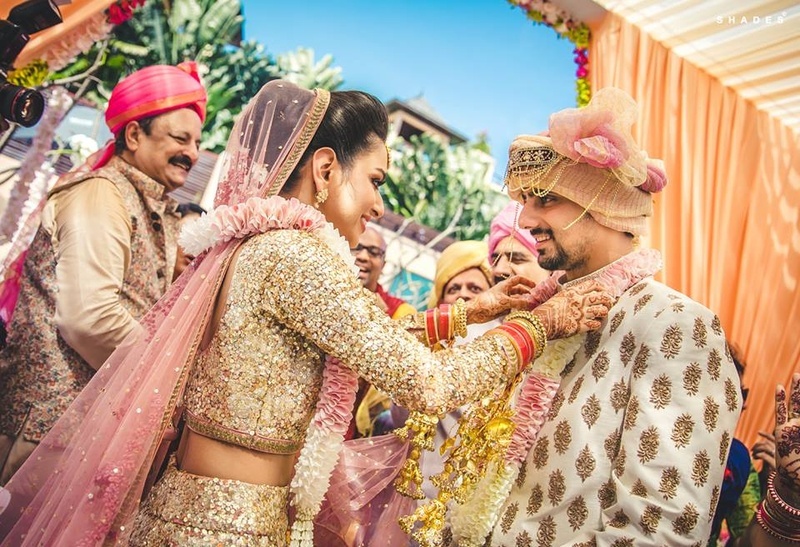 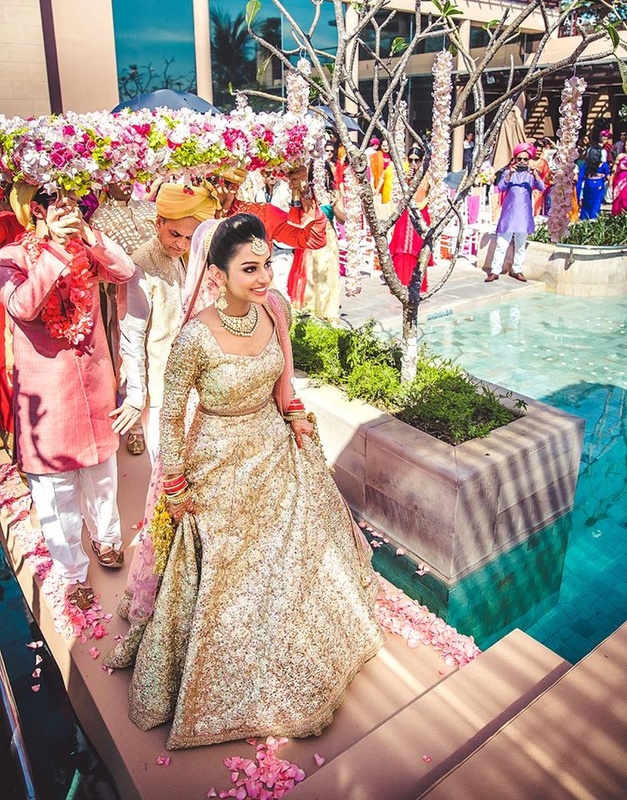 Glittery in gold, Mugdha and donning a Manish Malhotra attire, Pranav chose a floral theme for their wedding and the venue was akin to a floral fiesta. 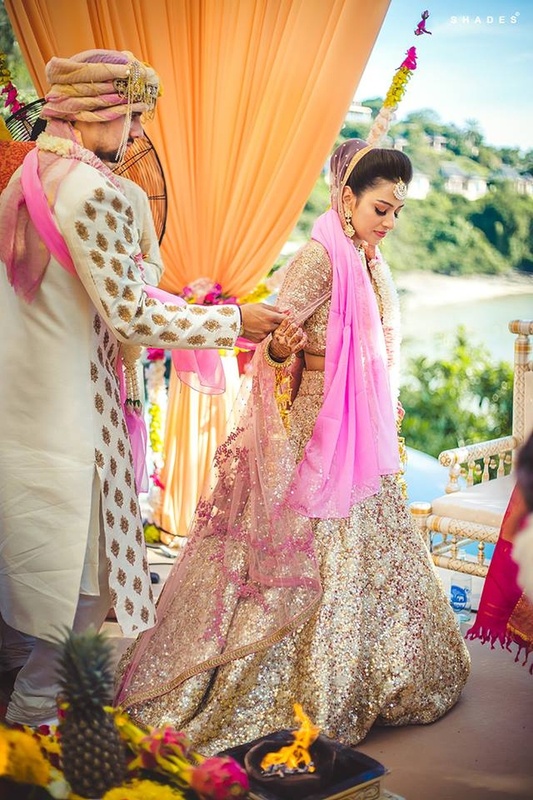 We loved the breathtaking colour coding of their attires. 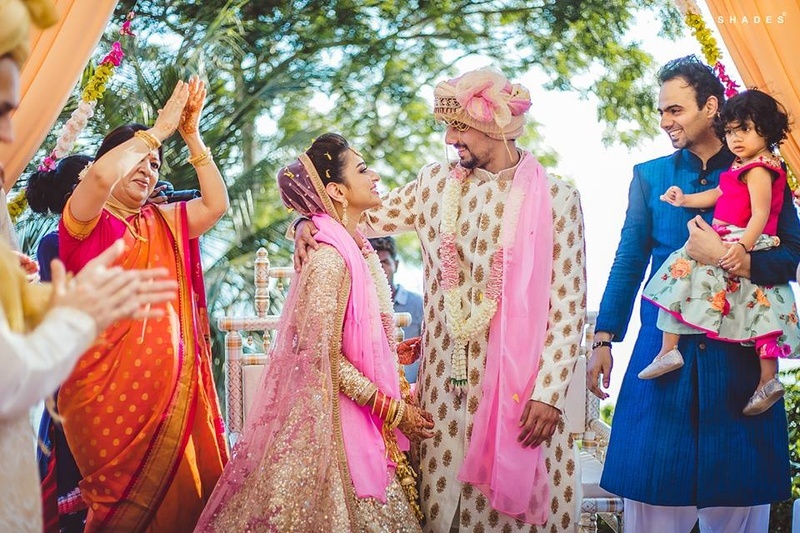 Be it the use of pastels or the blingy gold, the couple perfectly complemented each other and looked like one straight out of a fairy tale. 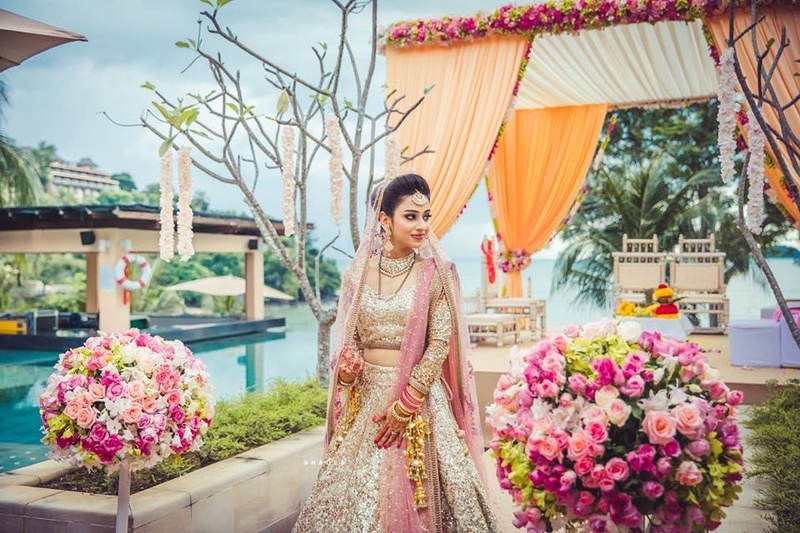 Floral colorful decor for the mehndi ceremony held in Phuket. 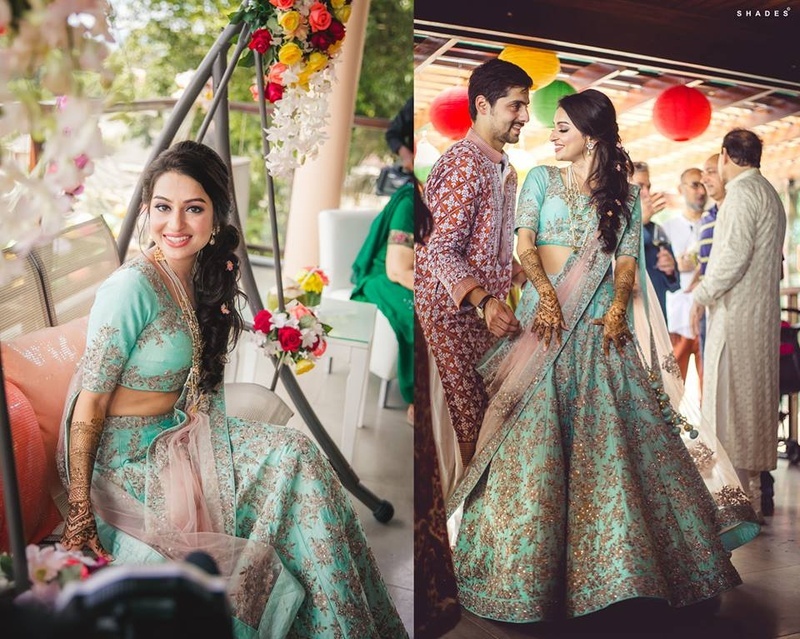 Dressed up in a pastel blue and peach lehenga for her mehndi ceremony . 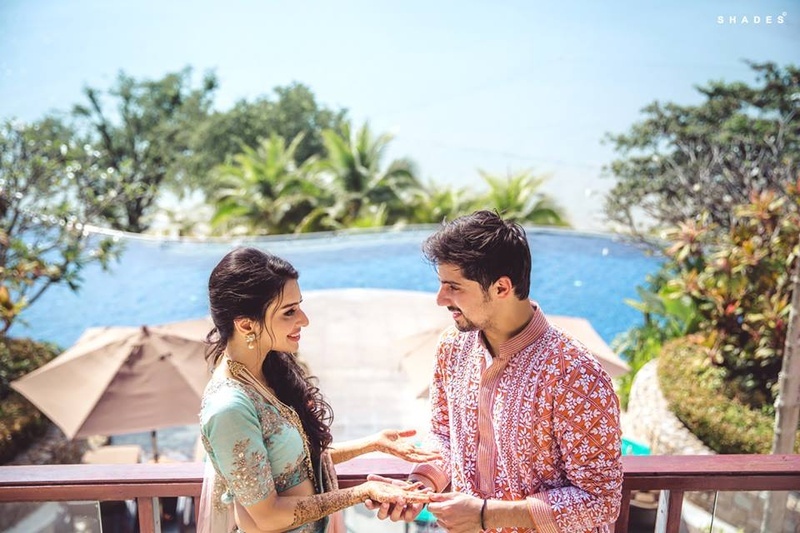 Complementing each other with pastel shade outfits for the mehendi ceremony. 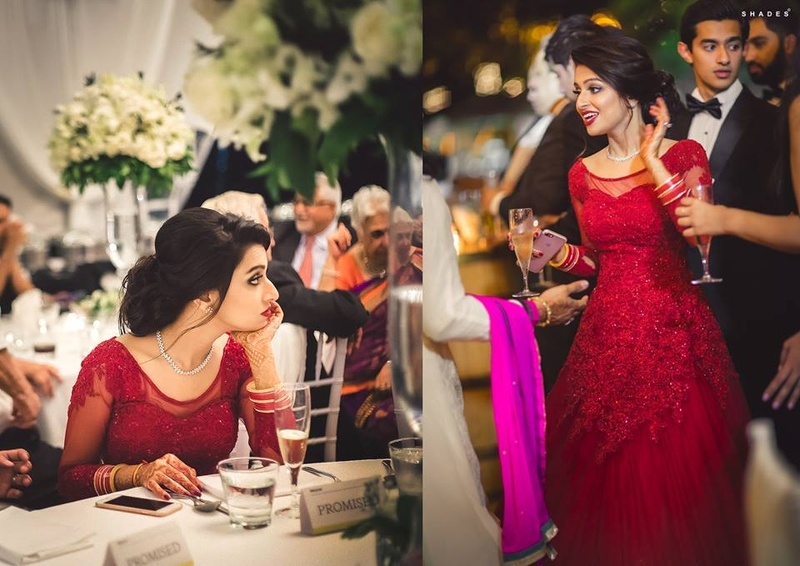 Classy and elegant look for mehendi day! 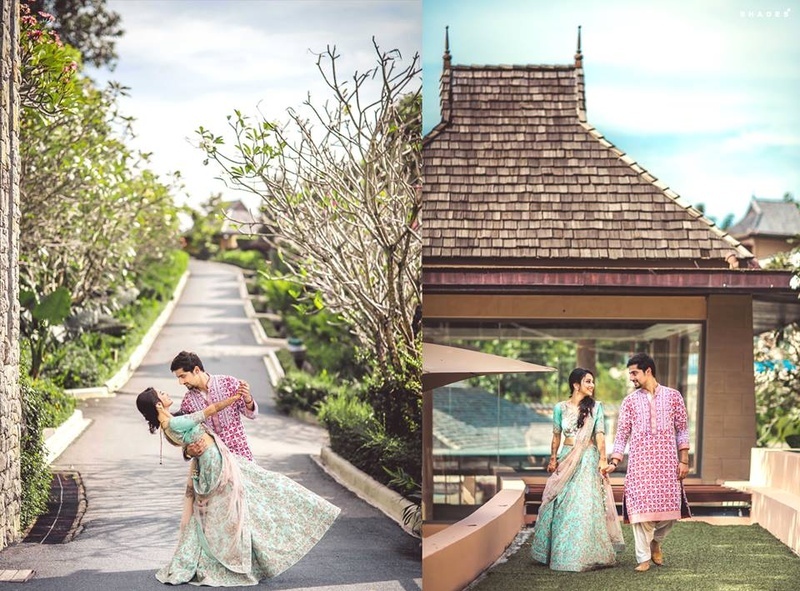 Couple photoshoot by Shades phootography . 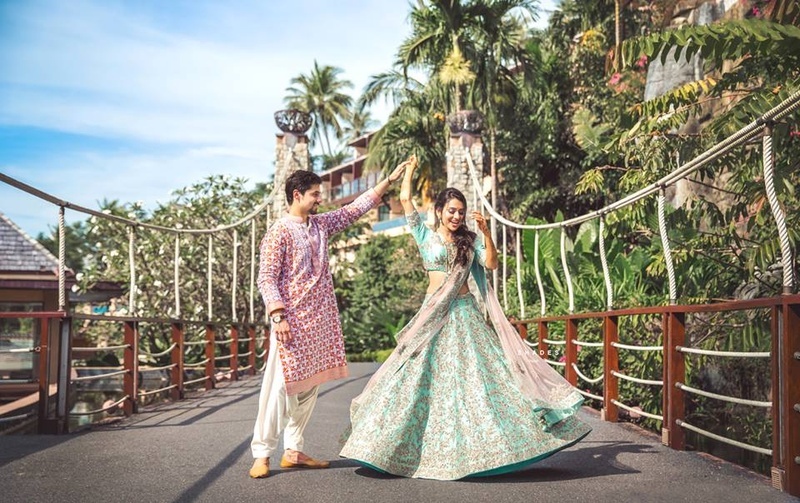 Complementing each other with color coordinated outfits for the sangeet day! 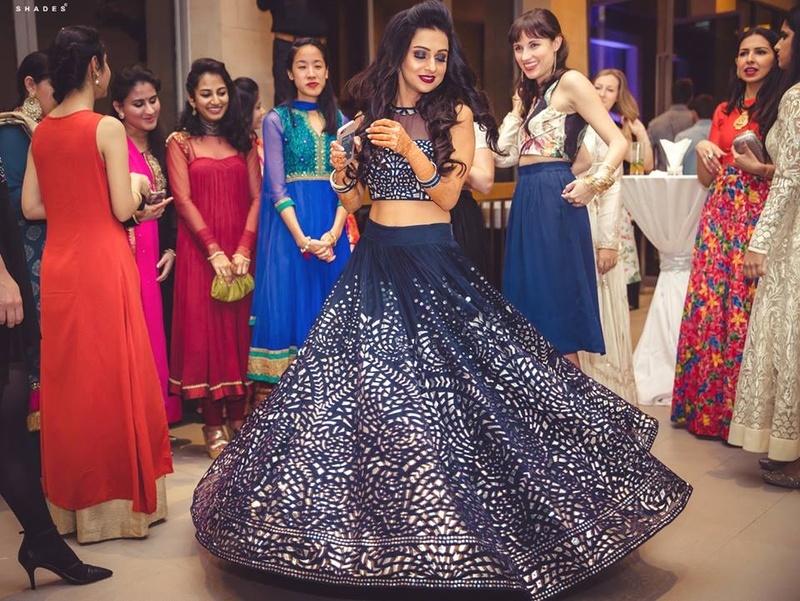 Mugdha dressed up in dark blue gota patti lehenga for her sangeet ceremony. 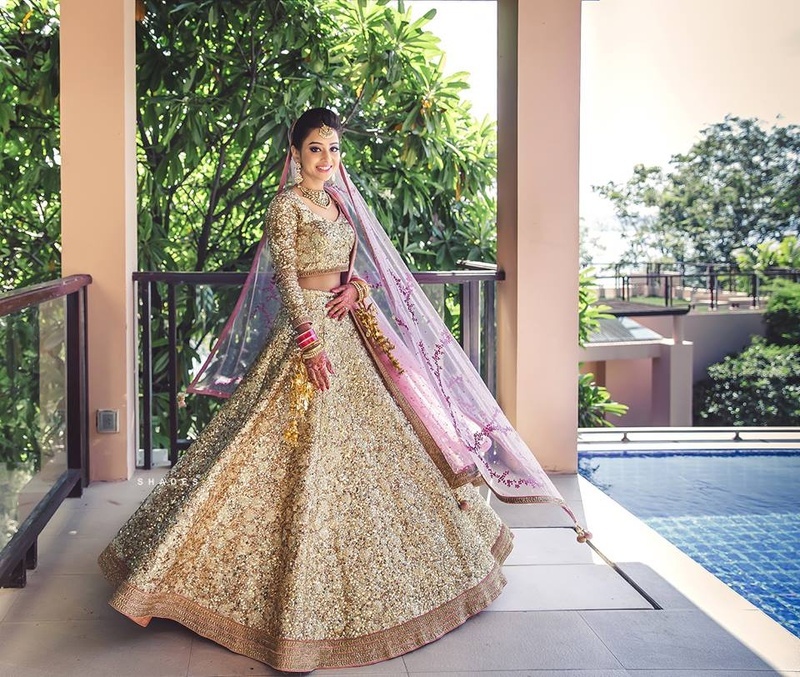 Gota patti lehenga for sangeet day! 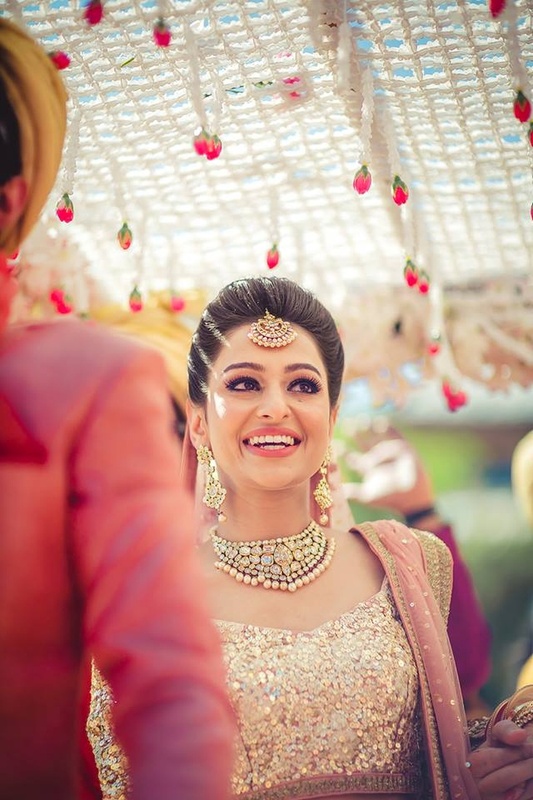 Styled with very minimal makeup and jewellery. 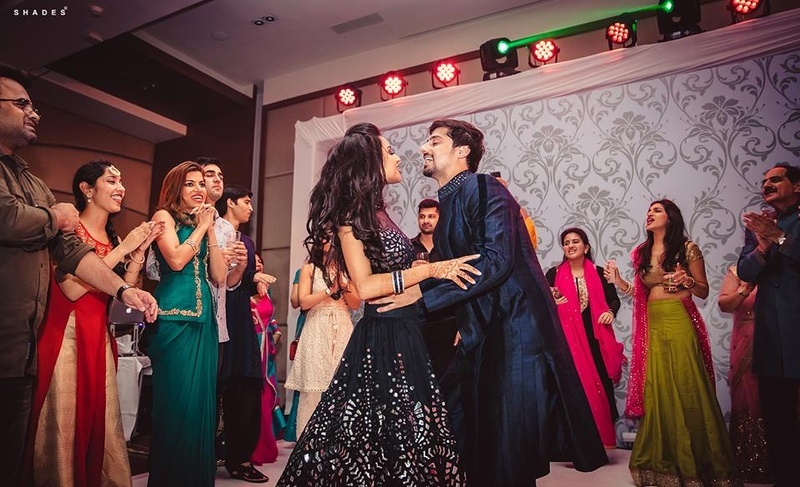 Bride and groom at a dance performance. 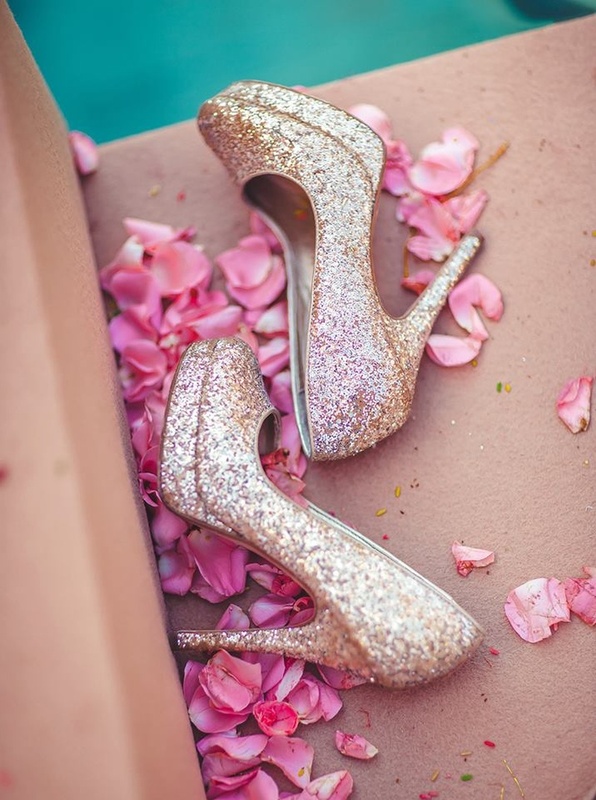 Glittering gold bridal heels for the wedding day. 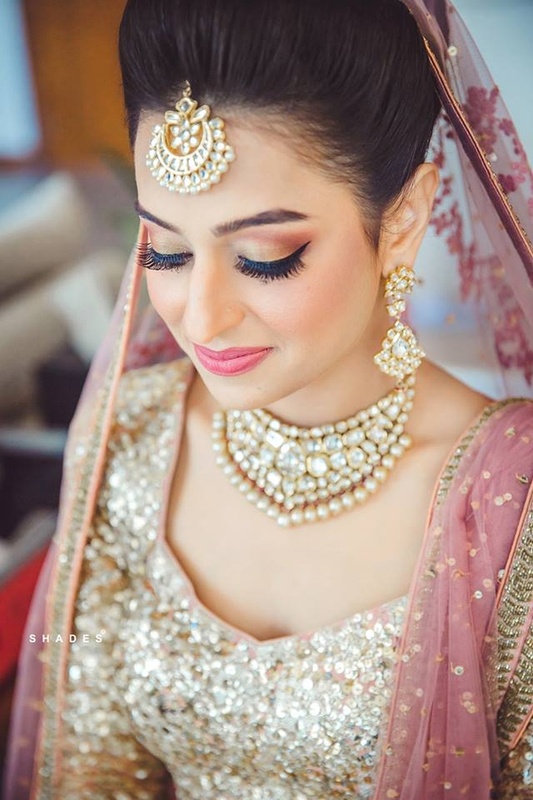 Bridal makeup by Ablaze by Simran Thakkar. 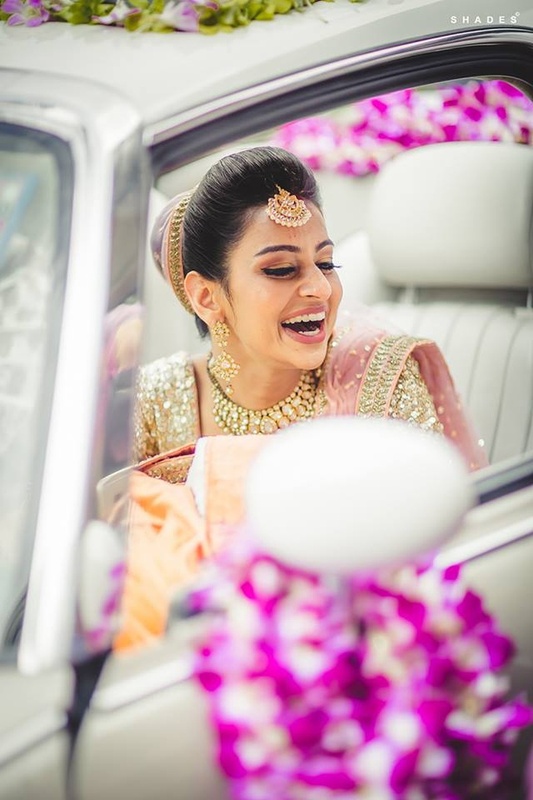 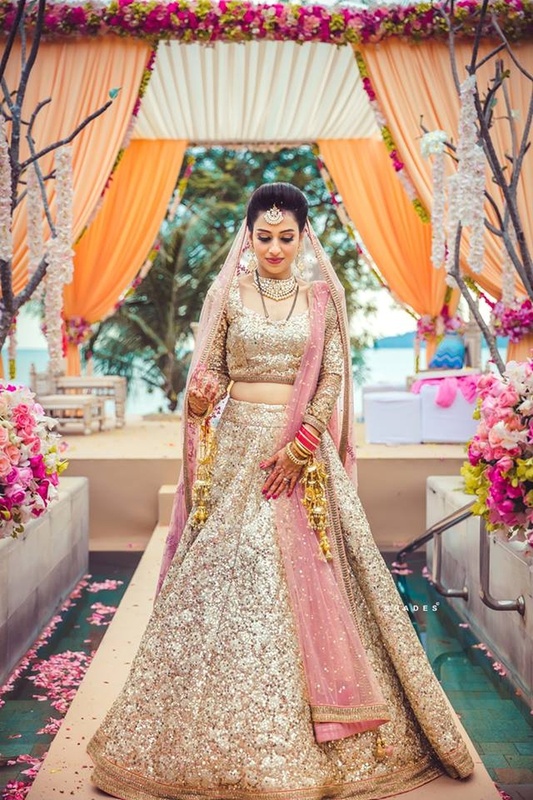 Dressed up in a glittering gold bridal lehenga paired with pastel pink dupatta and styled with polki jewellery for the wedding day. 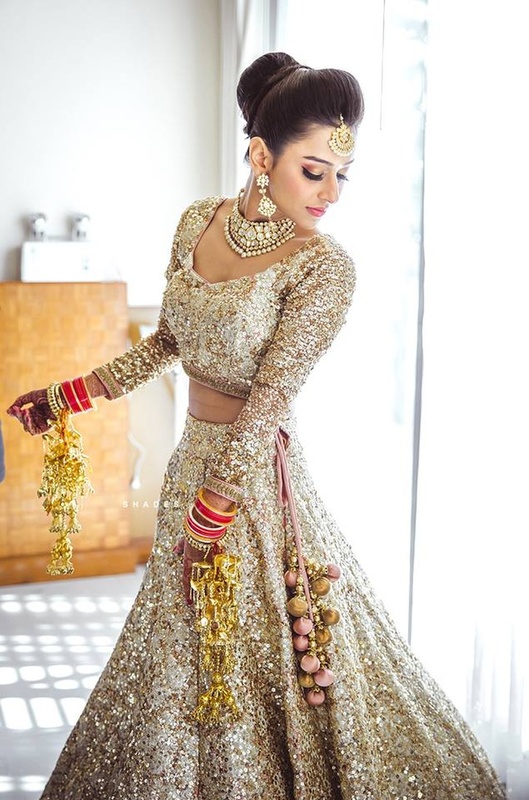 Looking absolutely gorgeous in this glittering gold bridal wear. 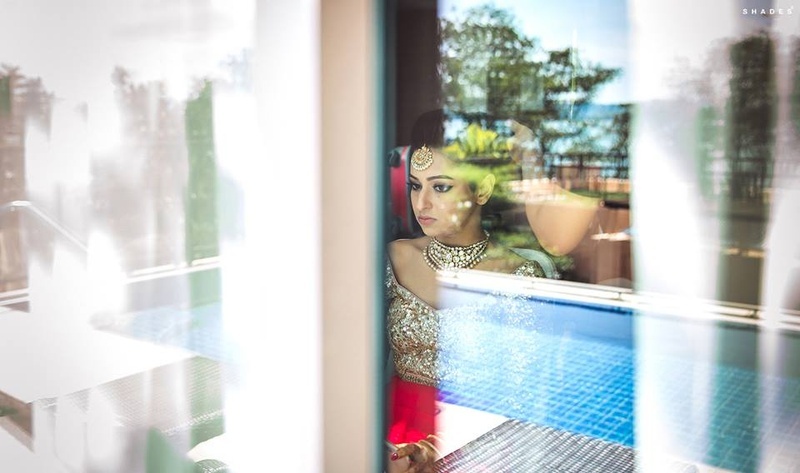 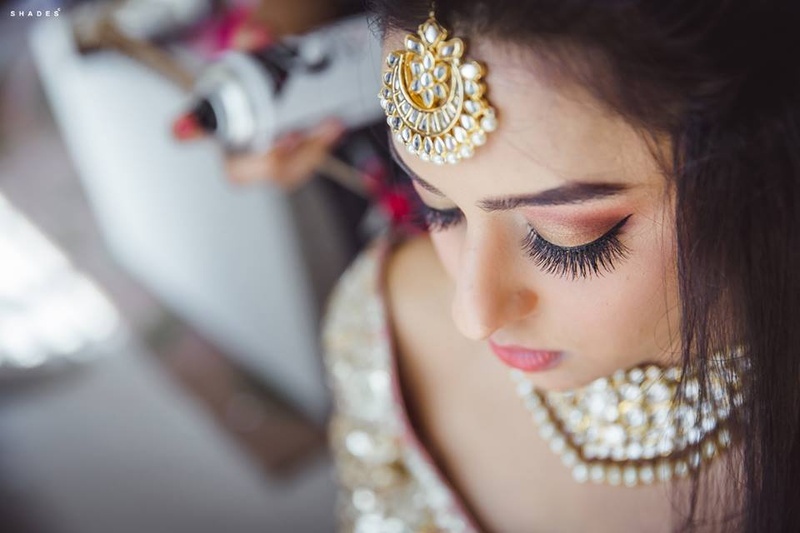 Flawless makeup by Ablaze by Simran Thakkar for the wedding day! 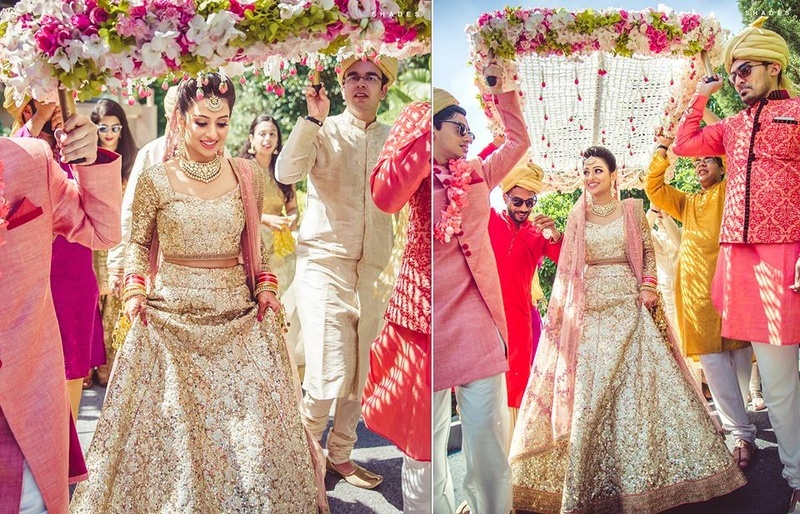 Florally gorgeous bridal entry under phoolon ki chaadar. 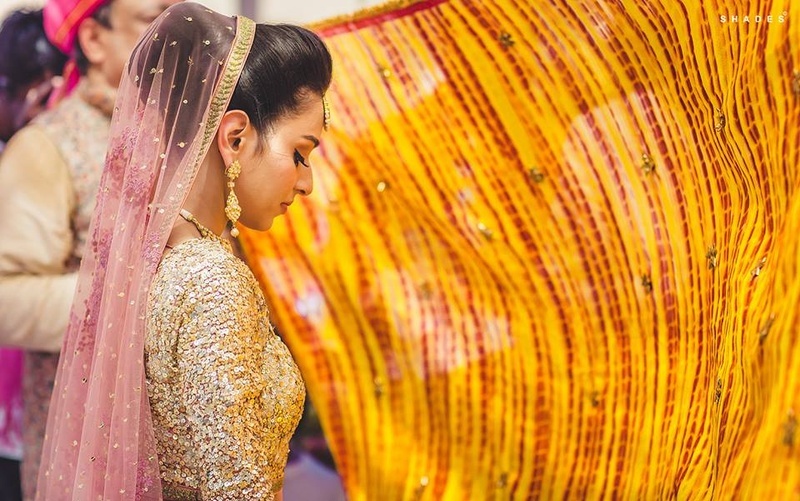 Beautiful phoolon ki chaadar for bridal entry! 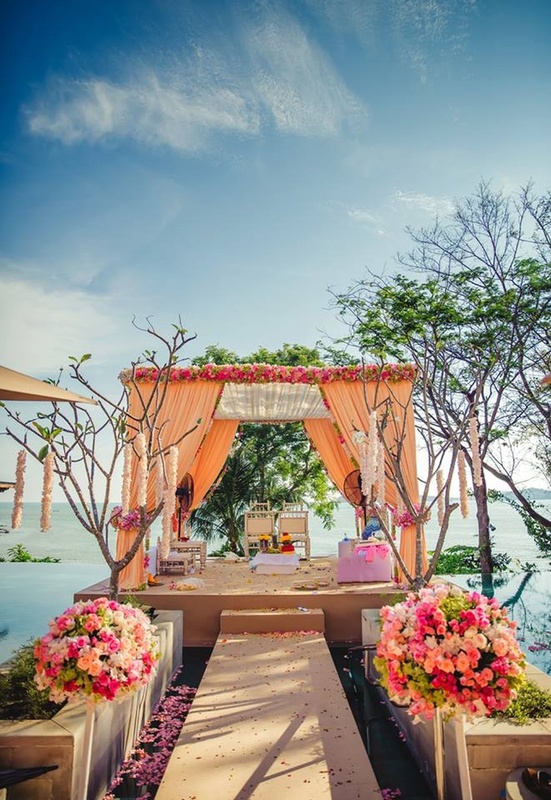 Floral decorated wedding mandap for a gorgeous destination wedding held in Phuket. 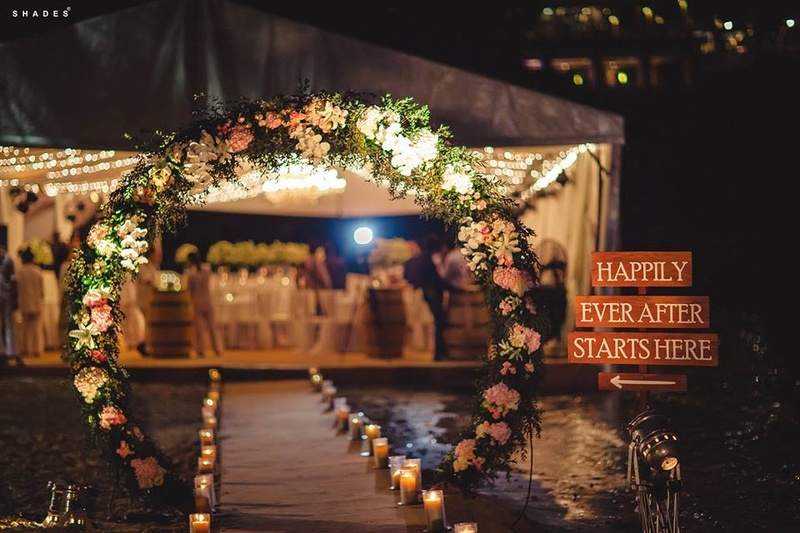 Pastel wedding decor for a destination wedding! 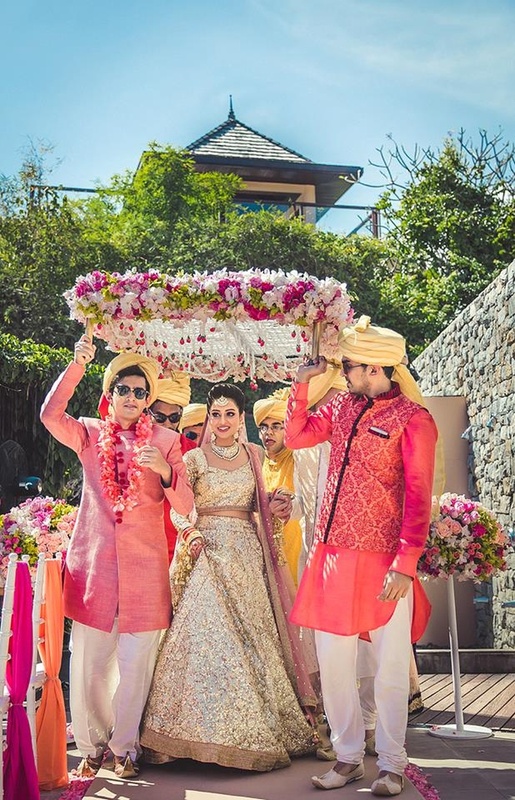 Bride and groom dressed up in color coordinated wedding outfits! 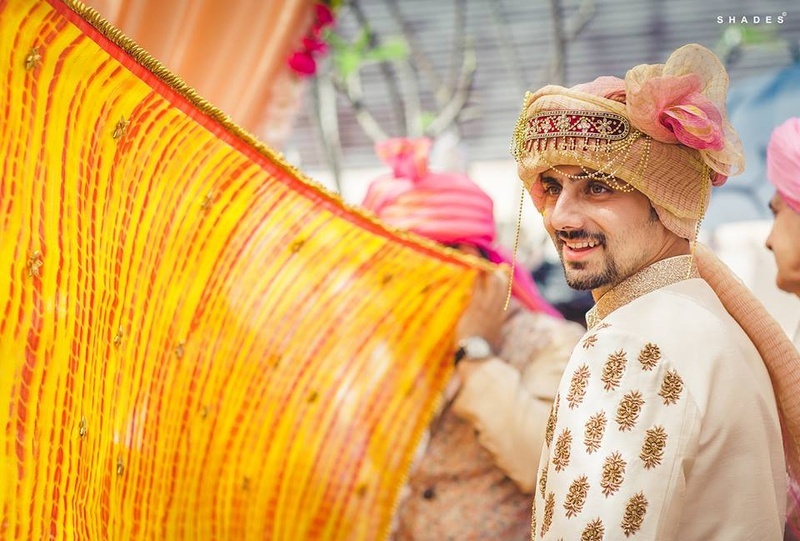 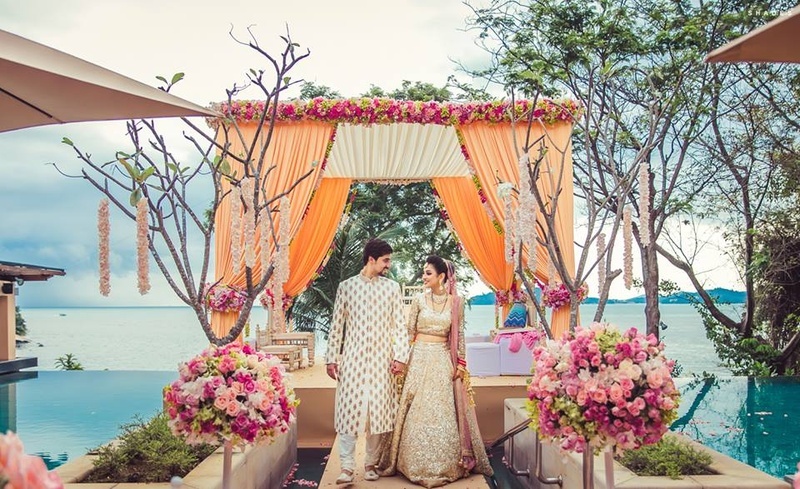 Gorgeous hindu destination wedding pheras held at Westin Siray Bay Resort and Spa, Phuket. 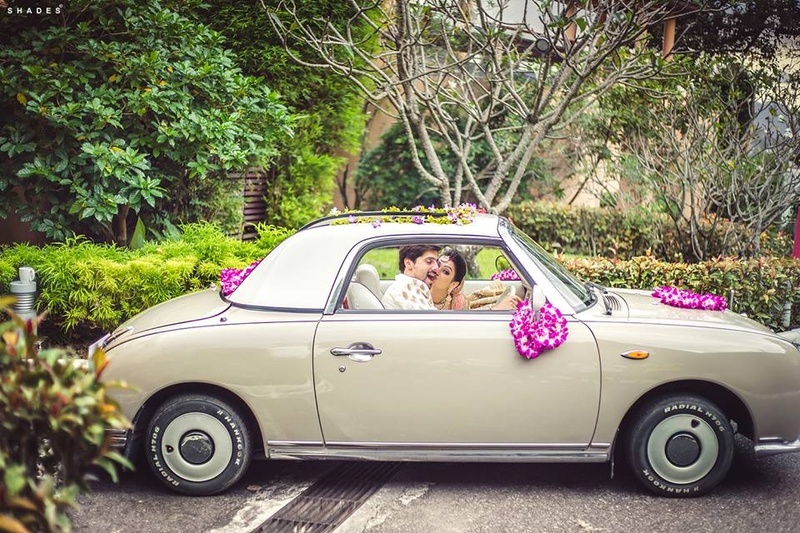 Couple shoot by Shades Photography. 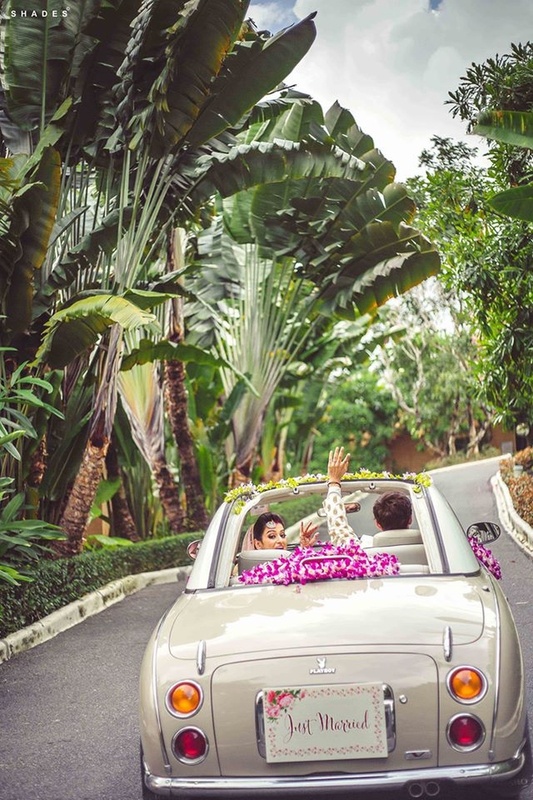 Floral decorated wedding ride for a destination wedding ! 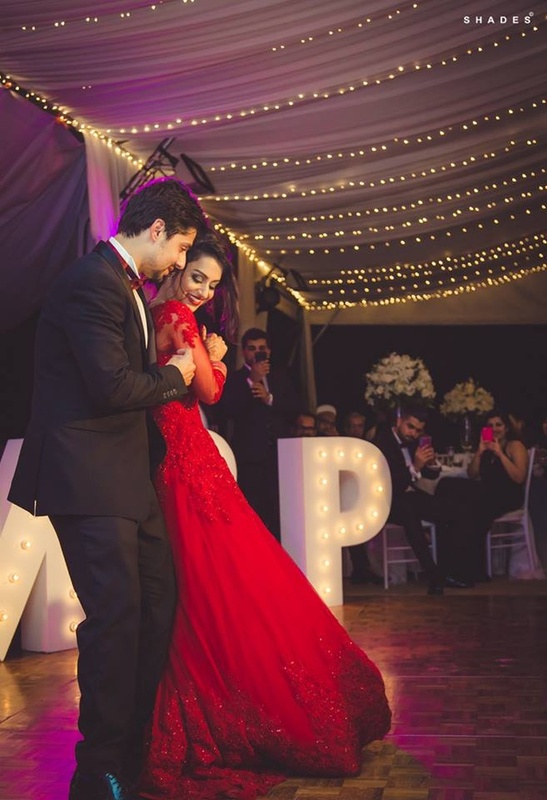 Absolutely stunning vidaai moment captured by Shades Photography. 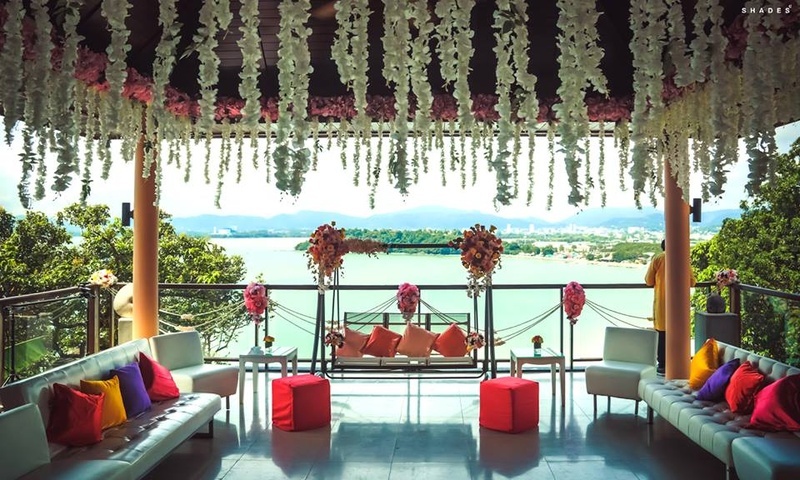 Floral decoration for wedding reception held at Westin Siray Bay Resort and Spa, Phuket. 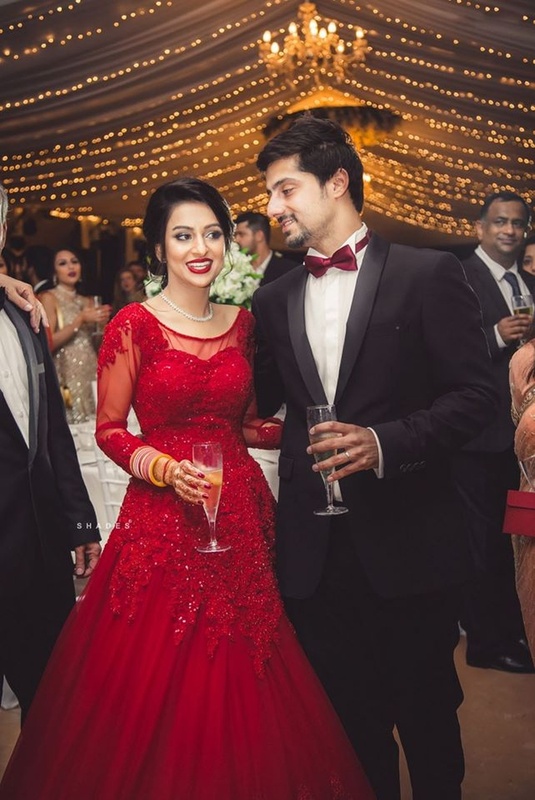 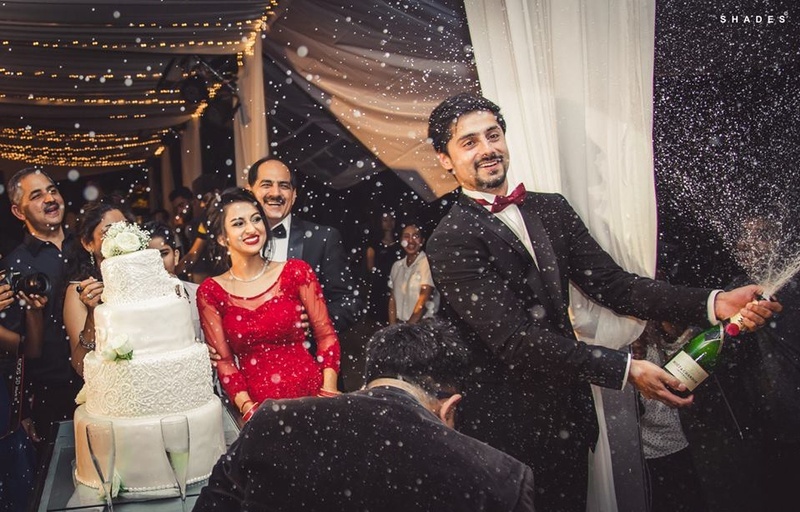 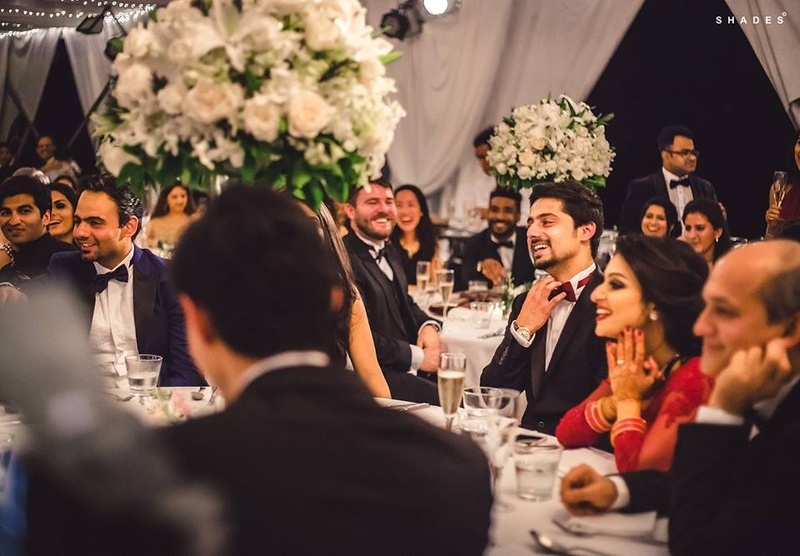 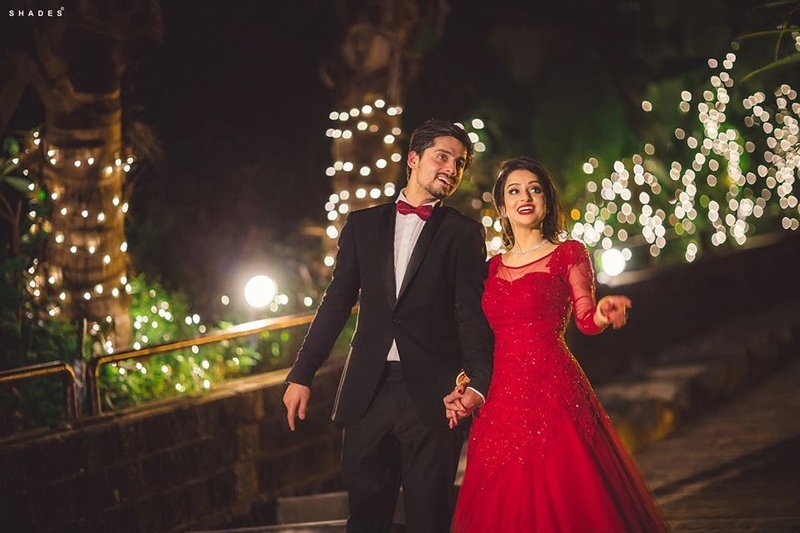 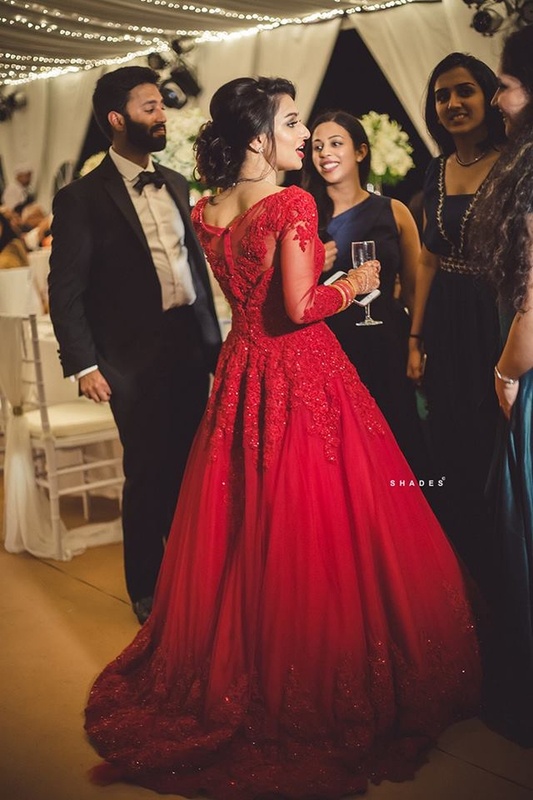 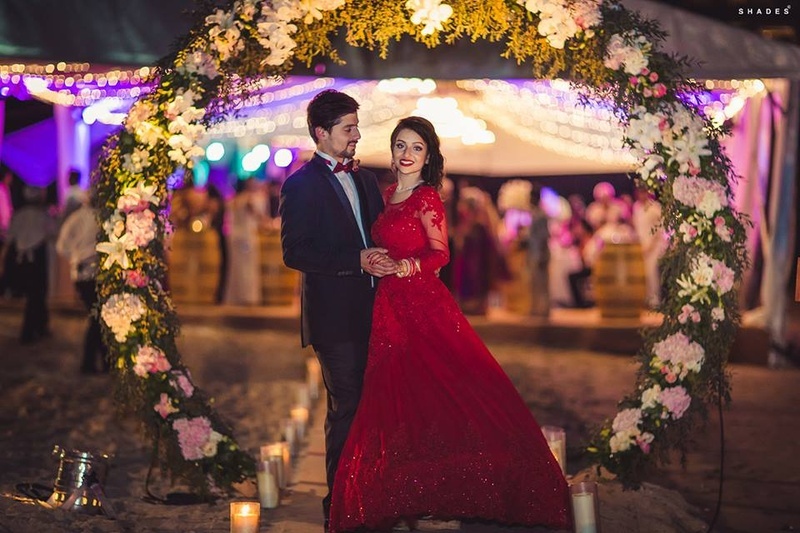 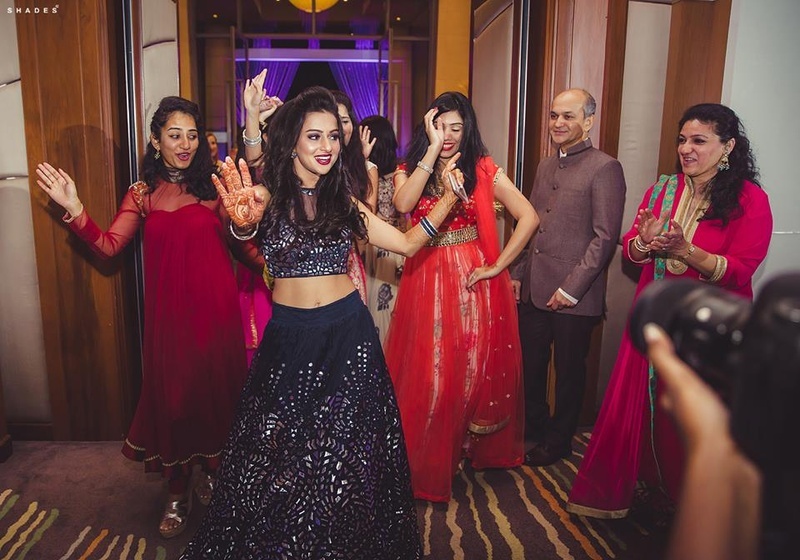 Mugdha dressed up in a blood red gown with diamond neckpiece while Pranav complemented her in a black suit styled with red bow for their wedding reception. 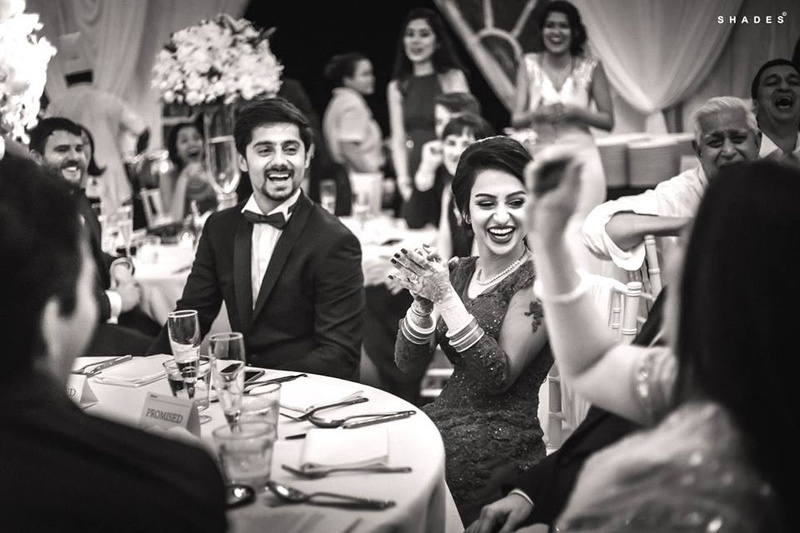 Gorgeous couple on their wedding reception. 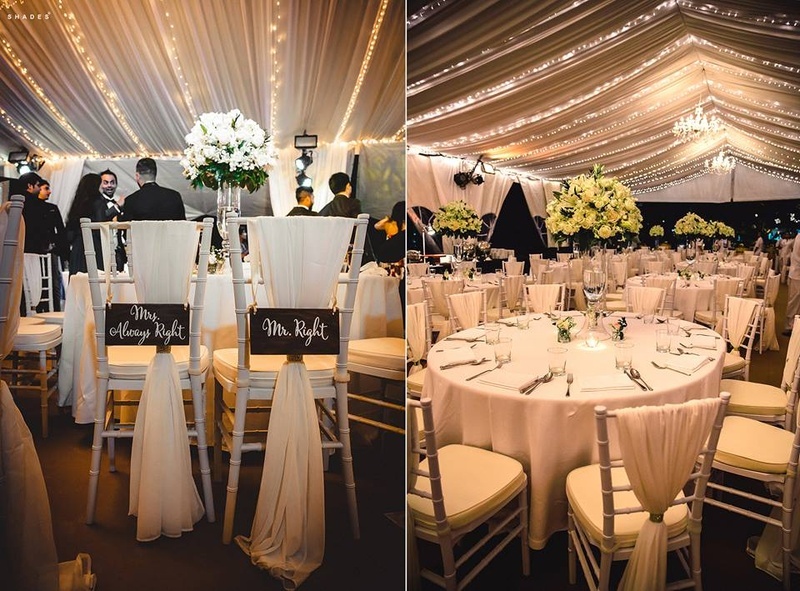 Wedding reception dining decor ideas! 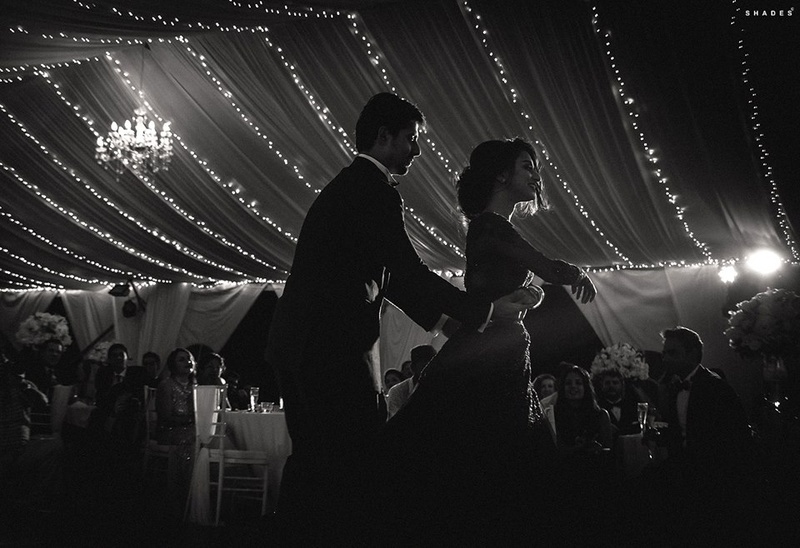 Black and white wedding photography by shades Photography.